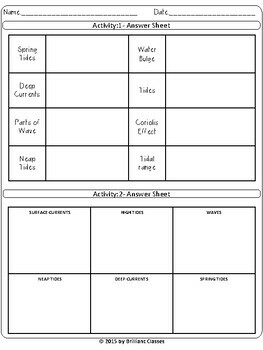 This activities are designed from Ocean, Currents, Waves and Tides Unit to carry out assessment activities in class for quick learning, reviewing and fun. 1. 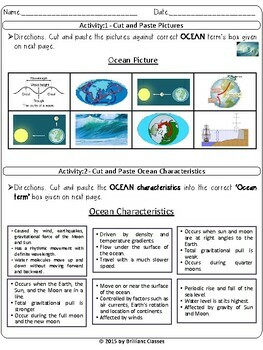 Students will sort pictures and paste them against to correct ocean term box. 2. Students are given the characteristics and will have to sort them to the correct ocean term box. 3. Same as 2 no. activities. 4. Students will identify types of tides as per the given pictures, and draw the oval on earth to show highest/lowest tides. 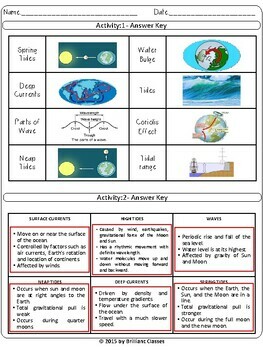 You can check out my Ocean, Currents, Waves and Tides unit with worksheets for teaching in classroom with colorful pictures and examples.